[mrgreen] Anyone coming across a Battlestar Galactica Slot machine review is likely doing so because something about the machine stands out. Perhaps you have a love for pop culture and fun gaming. If so, you may be able to indulge in both the minute you give this slot game a try. There were two Battlestar Galactica television programs. The one in the 1970’s was known for its rather awful scripts, but fun charm. The second series, a re-imagining, was much better. 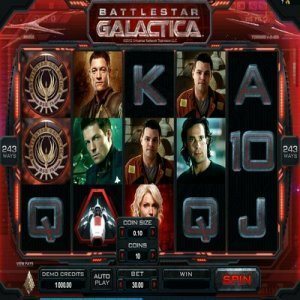 For those who wish to reexperience their favorite sci-fi program, playing the Battlestar Galactica slot machine game might be the best way to do so. In a way, when you play this slot, you feel almost as if you are actually watching the classic television shows since the graphics are borrowed right from the programs. For those who have a love for the program, seeing those memorable graphics definitely is going to add some value to the time you invest wagering in front of the screen. Familiar faces from the television series pop up each time you play. Perhaps the images of the characters will give you inspiration. The wagering on the slot machine is fairly easy in concept and provides acceptable paylines you are going to commonly find in slot gaming. The basic wagering with coin values is in the range of £0.01 to £0.05. You cannot alter the paylines, but there is no reason to fret too much over this since you can also place a decent wager from the range of £0.30 to a cap of £15.00. Yes, your maximum wager is £15.00 meaning you could score a huge payoff if you are willing to press your luck that much. The potential to win is increased thanks to the fact this is a 243 ways to win slot. Consider that another plus. A massive jackpot of 1,400,000 coins hangs over the head of all who play the game. That is an awesome jackpot to shoot for and reflects a massive payoff no matter what your actual wager is. The massive array of special features further adds to the incredible value of the slot game. A very simple, but no less appreciated benefit, is the experience ranking bar the slot provides. Basically, you accumulate experience each and every time you make a spin on the slot. The more experience you gain, the more special features you end up being able to access. There are also three different game modes that you can select ensuring the game is never boring and features are varied up with each mode. All in all, the Battlestar Galactica Slot Machine game is really worth the time playing. The mix of pop culture, solid graphics, great features, and excellent payouts makes it one of the best slots available.